Cashmere, mohair, angora, sequin, eyelash fringe, and faux fur: these are the most luxurious and expensive yarns, often too costly to use for a knitting project of any great size. But these 35 breathtaking items are small enough that knitters can afford to indulge in the finest materials, and easy enough for beginners to complete with ease. Thumb through the exquisite photos of each specialty yarn, complete with descriptive introductions to its unique qualities and advice on how to work with and care for it. Follow the short and simple instructions to make a long scarf with bouclé trim, a snazzy flapper-style hat from a mohair-silk blend, and the ultimate pashmina shawl.Each item is dramatic and unique. 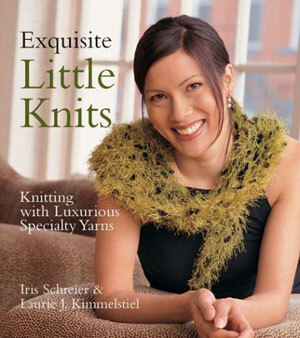 Every craft book must have a hook, and here it's the luxury yarns so readily available today. In the past, knitters had to rely on cables and other fancy stitches to spark up their projects, but today they can let a wide selection of glittery and glam yarns do much of the work. Displayed in sharp color photographs in a clean design, the fancy yarns are on display here by brand name. The book is divided by both project and type of yarn. Much information is given about each yarn and how it knits up, and several projects are offered for each. There is nothing very complicated among the projects: lots of scarves, shawls, and caps. But by using yarns as varied as lattice, mohair, eyelash, and fur, everything ends up looking great. Glossary and abbreviations are appended.